Editor’s Note: We asked Abby Smith Rumsey, an expert on scholarly communications, publishing, and the changes being wrought by new technologies, to put what we are trying to do with Boom—bringing our great universities and the public into conversation—in historical perspective and shine a light on the path ahead. Invited to offer a vision for scholarly communication in the coming decades, my mind lights up. At once I see a world in which advances in knowledge and new critical perspectives are communicated swiftly and directly to an engaged and curious public, a world in which experts cultivate an informed citizenry along with new science and scholarship, and our cyber-infrastructure supports an open, accessible, mutually comprehensible and respectful conversation between specialists and their publics. Experts readily acknowledge the responsibilities that come with their privileged status, responsibilities to the public who count on them and to whom they are accountable. The public is assiduous in seeking knowledge and participating fully in its stewardship. In this world of proliferating arenas of expertise and specialization, we accept that we are, each and every one of us, “the general public” in all things except our own particular area of knowledge or skill. To the mycologist, a microbiologist is a layman, and to the expert on Leonardo da Vinci, the Nobelist in economics is at best an amateur in matters art historical. But, collectively, we advance knowledge and attend to the responsible use of that knowledge. Stand/Deliver at Soundwalk, Long Beach. Utopia, right? This vision is hopeful, no doubt. I describe a world I would want to live in and would be proud to pass on to the next generation. But it is in no way utopian. I was thinking of the past. As a young child in the 1960s, I was an unwitting witness to a massive awakening of an elite to their responsibilities to be open and share the stewardship of their privileged knowledge. I refer to Vatican II. Under the leadership of Pope John XXIII, the Roman Catholic Church convened a council of leaders that, among other things, redefined the relationship between priests and parishioners. The Church told priests to turn around, face the people during mass, and perform the rites in the language of the congregation. In seismic terms, this was a massive shift of continental plates whose dramatic release of pent-up energy reverberates to this day. Vatican II created two tectonic displacements of authority. The first was a rhetorical shift: the translation of the mass from Latin into the vernacular gave people direct access to the sacred liturgy. The second—the spatial equivalent of the rhetorical displacement—was the turning of the priest to face the congregation. Before Vatican II, the celebrant spoke not out to the faithful but up to the heavens in words meant only for God. The change in orientation was no doubt a bit tardy. It has been a long time since any ecclesiastical body monopolized the power of explanation and consolation—this is how the world works, this is who we are, this is why we are here, and this is how to deal with pain and death. By the end of the nineteenth century, the natural and human sciences had taken that mantle of authority for themselves. With that authority, they also took the mysteries of enchantment, fully appropriating the affects of awe that are inherent in the power to turn mysteries into problems, as Noam Chomsky phrased it. Revealing that the universe is 13.8 billion years old, that our brains have 100 trillion synapses, that cockatoos make tools, and crows can count—awesome! But the power to explain and enchant comes with responsibilities. Our government was set up as a democracy that empowers elected representatives to exercise the people’s will. The citizens, in turn, are obligated to be informed and select informed representatives, to hold those representatives to account, and to ensure that the government makes information and education freely accessible. Today’s secular public increasingly recognizes not the clergy, but scientists, scholars, and artists as experts with privileged access to truth. They constitute a recognizable tribe: professionally credentialed following a decade or more of strenuous training; adhering to strict and transparent methods of truth finding, such as hermeneutics and the scientific method; lending their learning to policy makers on some of the thorniest problems our nation faces. In the twenty-first century, artists’ and scientists’ mastery of materials science and computer code has given them command over the affects of awe and wonder that religion and magic still control in nonsecular societies. They wield these affects deliberately, both to enrich the lives of the public and to seek their continued support. I need only point to the effective use of the widely distributed color-enhanced photographs taken by the Hubble telescope to redeem this troubled scientific exploration in the mind of the public and reconfirm their commitment to support the mission. This was a masterful form of persuasion in which artfully invoked awe trumped argument when logical explanations of Hubble’s long-term value failed to captivate the public. What does this have to do with scholarly communication? Everything. The communication of scholarship through the translation of expert knowledge from domain-specific language to the language of another domain or the vernacular serves two constituents: those who create knowledge and those who use knowledge. As currently practiced, scholarly communication often conflates serving scholarship in the advancement of knowledge with serving scholars in the advancement of individual careers. The causes for this are complex and beyond the scope of this essay. But it is important to note that this turn is a relatively recent phenomenon. Expanding our view of scholarly communication will benefit not only the public but scholarship, too. Those who create knowledge need a reformation in scholarly communication to lower the high cost of collaborating across disciplines. Imagine the Leonardo specialist, an expert on the emergence of humanism and its consequences for visual representation (a subject of keen interest in the media age) partnering with the economist to look at long-term trends in the commodification of art objects and the effects on global trade—or the fungus scientist and microbiologist investigating strategies to mitigate the spread of disease-causing molds, likely to increase in the coming decades of rising sea levels and severe, frequent flooding. Each expert is fluent in their highly specialized domain-language and research technique. Both experts will need to find a shared language, a way of explaining what they do, how they do it, and what their fields contribute to solving specific problems. The issue of translation, then, of moving from an esoteric language to the vernacular is not simply one of the expert talking to the curious public. It is also, and fundamentally, about two experts communicating across the chasm of disciplinary subdivisions. While a very small group of people actually create knowledge in any given domain, it is the vast majority of nonexperts who are called upon to make decisions about how that knowledge is deployed, how the technologies that devolve from it are implemented, for what ends, and under whose oversight. Given the scope of pressing social, economic, and environmental problems facing us, experts from many different subdisciplines will be under increasing pressure to collaborate in problem solving. Each of these collaborations will produce several varieties of possible solutions, which then become matters of public policy. These matters are never questions of choosing between clear good and pure evil. We face a series of trade-offs between competing ends and do so with imperfect knowledge of future consequences. Many such problems—water pollution, soil depletion, overfishing—arise from our current and past uses of technologies. We will inevitably create more technologies to mitigate them. As we do that, we are likely to continue in a well-established pattern of creating a technological solution to one set of problems, only to discover later that the solutions themselves produce unintended consequences. Geo-engineering to create deceptively named “green energy” could help us move away from consumption of fossil fuels. But what would happen to coastal marine ecosystems, for example, if we choose to capture energy from waves, say, of Pacific coastal waters and the currents of the San Francisco Bay? Genetic engineering could obviate the ravages of some diseases. But what impact would the cure and prevention of Alzheimer’s disease have on a population already growing beyond sustainable levels, consuming more and more resources, straining Social Security and Medicare, or continuing to occupy senior positions in various companies and blocking the rise of younger talent—what I call the Queen Elizabeth Syndrome? Such solutions will use technologies as the means to an end, but decisions about which means will not be based on their technical efficacy alone. We must factor how instrumental knowledge operates within specific cultural and legal frameworks. Humanists and artists are particularly qualified to understand and represent complexity and cultural specificity, and, through storytelling, to engage publics in conjectural thinking about the future, making visible the trade-offs that are involved in some of these major public policy issues. Facing the people and speaking the vernacular becomes absolutely vital to find and implement minimally invasive technical solutions wisely. This is where California is uniquely positioned to take a leadership role. Both the sciences and the arts rely increasingly on the type of specialized labor and expertise that grows well in the Golden State’s diverse soils. California not only has the computing and technology prowess associated with Silicon Valley (although in fact found across all parts of the state). California is also the home of the arts and entertainment industries, commonly associated with Hollywood but also distributed across the state. These are enterprises that use technology to stimulate the public’s imagination and empathy. Communication with the public should deploy the full spectrum of senses accessible to us now through media. Immersive technologies able to represent knowledge and stimulate speculation should become key features of this expanded communication. The dialogue begins in the classroom, or before, when toddlers and young children first speak and interact with knowledge and objects. Multimedia educational platforms for transmission of knowledge should be one of the Golden State’s primary businesses by 2050. 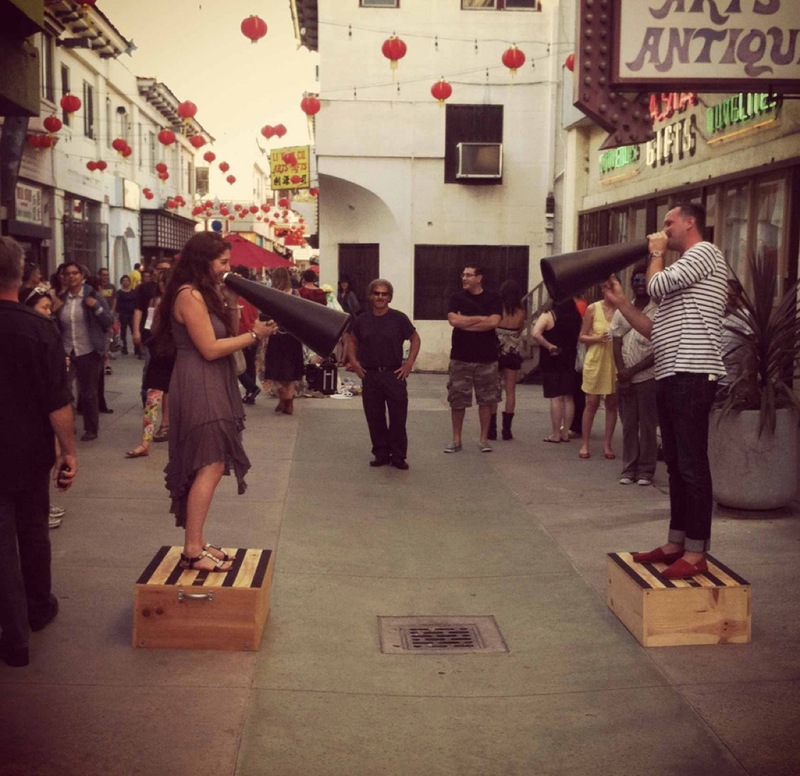 Southern California’s arts and entertainment industries should increasingly work in partnership with the data-intensive enterprises of Northern California to communicate and animate knowledge through learning technologies that include haptic experiences and storytelling. As science and technology expand our capacities as a species to modify our environment and ourselves, the arts will continue to illuminate the human condition through imagination and conjectural thinking, deepen our self-understanding, and inculcate in us a tolerance for ambiguity. The arts can help us to preview a future in which categories of race, ethnicity, and gender—categories that seemed absolute and unbreachable only a few decades ago—will lose relevance, though new categories of discrimination and exclusion based on access to knowledge may arise. Is this really a job for scholarly communication? Why not let journalism do this? After all, we see lots of news stories about advances in scholarship—granted they tend to be gee-whiz stories about science and engineering, with particular emphasis on biomedical research. The mission of journalism is valuable but distinct from scholarly communication. The journalists’ job is to cover the news. The scholars’ job is to make their particular area of expertise accessible—accessible on demand, not only accessible when something they do happens to make the news. This argues for a broadband platform that provides ready access to expert knowledge. A journal such as Boom is a model of one kind of medium for access to expert knowledge being put to use. There are publications such as Nature and Science that combine the communication of expert knowledge to other experts with feature stories that translate that knowledge into the vernacular, and provide the context for grasping the implications of that knowledge for policy-making and other considerations. Is it too much to imagine that each domain, from history to linguistics, do the same? The economics of making such access readily available is unclear, but the commitment to such access must come first and business models will emerge in time. Decades after Vatican II, sordid news about the abuse of parishioners by members of the clergy emerged. While a profound crisis of authority for the church, the unfolding scandal was not necessarily a crisis of faith for parishioners. After decades of direct stewardship of many parish responsibilities, some church members had the will to purge the church of abusers and those who protected them, a will accompanied by a clear sense of the power to do so. While of a very different order, there will be similar challenges to the public trust in scientific and scholarly experts. There will be times when those who advance knowledge will be negligent or abusive of their powers, when we read stories of scientists falsifying research results, historians profiting from plagiarism, lab directors treating students and employees irresponsibly, researchers hiding financial arrangements with research and development firms, experts of all kinds gaming citation systems to pad their resumes, and so forth. The increasing economic value of the products of expertise will create a corresponding rise in temptation and corruption. We must have an informed public able to distinguish between the valuable enterprises of science, humanities, and the arts, and the failings of some practitioners themselves. We cannot simply assume that we will have such a public. We must actively cultivate them, and that is the job of scholarly communication. The United States has a long and robust history of anti-intellectualism and now, increasingly, segments of the population are anti-science. We are already seeing the dangers inherent in a citizenry who pick and choose their evidence and how to interpret it—creationists who disclaim the theory of evolution, for example, and yet clamor for next-generation antibiotics to combat bacteria that have evolved to be drug-resistant. It goes almost without saying that we shall have to find a new term for the work ahead, for “scholarly communication” fails to connote either the audiences for or the intentions behind this communication. I have been using the term “expert knowledge” in lieu of “scholarship” to acknowledge that information vital to our well-being is generated by many who are not traditionally considered scholars and that what is of greatest value is the knowledge that such experts create from raw information and data. Whatever term we embrace in the end, what matters is to focus equally on those who create and those who use knowledge. As we look back at the long-term effects of the Manhattan Project, we see not only major breakthroughs in physical science and engineering that have been used in war and in peace. We see an awakening of experts to the power of the knowledge they have created to change the world, and the humbling recognition that they have little control over how that knowledge is used. It was at that moment, when scientists such as Albert Einstein, Leó Szilárd, John von Neumann, and Robert Oppenheimer realized that they had responsibilities beyond their labs, that they began actively working with policy makers and communicating their expertise broadly. Thus began a golden age of science. The challenges and opportunities we will face in the coming decades will demand the same humility, concern, and commitment to engage in translating expertise for multiple audiences and attending to the consequences of using knowledge responsibly. 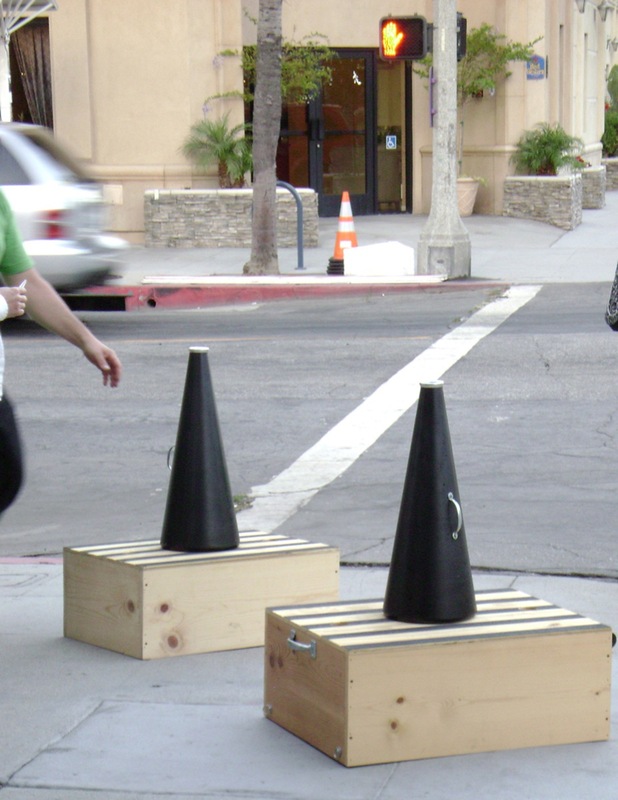 Images from Stand/Deliver, an interactive installation, were provided by Los Angeles-based arts collective Finishing School. 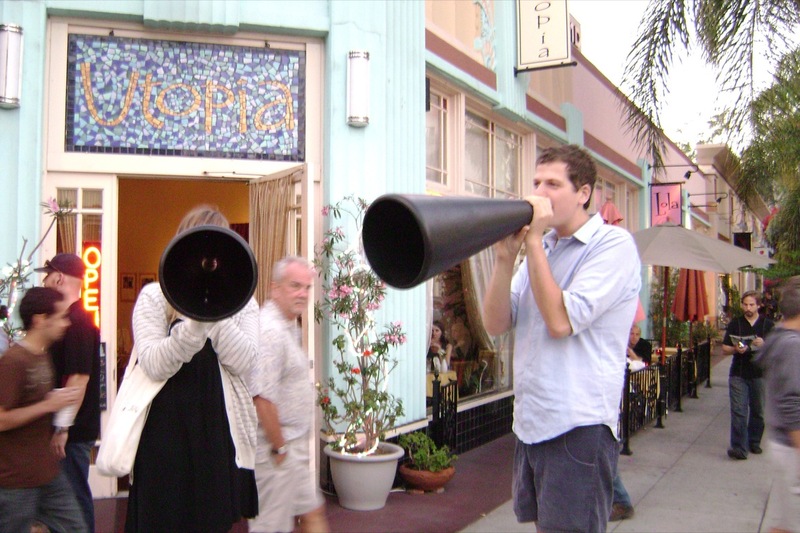 The “dueling free speech unit” consists of two portable platforms and megaphones, and whomever would like to face the people and speak.